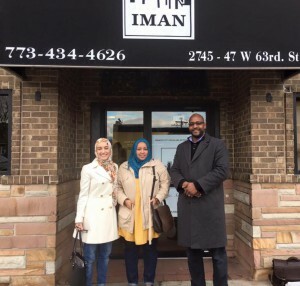 Inner-City Muslim Action Network, (IMAN) is pleased to announce the IMAN Atlanta Project. This project comes after several years of working closely with leaders in Atlanta and successfully training local community organizers. The Atlanta team will serve under the leadership of Mansoor Sabree, who is IMAN’s first Regional Community Organizer. In keeping with IMAN’s vision, the Atlanta team will work to “uphold the Muslim tradition of facilitating transformational change in urban communities, by inspiring others towards critical civic engagement and exemplifying prophetic compassion in the work for meaningful social justice and human dignity beyond the barriers of religion, ethnicity, and nationality.” IMAN Atlanta looks to expound upon the 18-year model of IMAN—”Change, Serve, Inspire”—within the Atlanta Community. IMAN Atlanta will host its very first CommUNITY Café in Atlanta on Saturday, March 19th. This entry was posted in News, One Nation, Organizing & Advocacy by IMAN Staff. Bookmark the permalink.